A work day sees us barrelling down the motorway from our eyrie in the north, to the southern end of this fair island, en route to a meeting with our financial adviser, and then onwards to our accountant for end of year submissions. These are prepared in record time, and, with the press of a button, wing their way electronically to Hacienda. 19.06.2013 - With impeccable timing, (and no little advance planning) we find ourselves free to celebrate the end of another financial year. The recommendation for today (by a lady who has visited this restaurant no less than seven times) is to go to La Caleta, hard by the southern coast, and there to take our repast at El Caldero, where, we are guaranteed, we will feast most sumptuously. The drive towards the village passes along some lovely roads bounded by shrubs and palms, but nothing much else. The immediate hinterland is barren and rock-strewn from the previous passage of vast mechanical leviathans. We have never been to La Caleta before. It is charming. A small cove is surrounded by a walkway, behind which there is a string of bars, restaurants and private villas. Some of these restaurants appear in various upmarket guides. Boats bob in the harbour, and strapping chaps in wetsuits bob rather more energetically further out, chasing non-existent waves. We make for a very smart bar for the pre-prandial snifter, which, because I am driving, is limited to a soft drink. When the bill comes, not only is it someone else’s but, when righted, we find that coffee and Nestea are more than double the price of a similar place in Puerto de la Cruz, and that before IGIC! Oh, dear! We hastily move towards El Caldero, further along the promenade in the direction of the main beach. What an attractive place this looks. Smart, clean, nice awnings and a scattering of tables outside. And it is busy! We capture a table for four (tables for two are quite small) and menus are brought, together with a wine list. The fishy section of the menu is extensive, as is the list of tapas. Echoing its given name of cooking pot or cauldron, there are fragrant smells wafting out from the kitchen, and I am invited to the interior restaurant to view their chilled fish cabinet, well stocked with fresh fish and shellfish. I am assured that no frozen fish passes their portal. Two glasses of light crisp white wine accompany the house salad, dressed as pretty as a picture. My wife then moves on to a plate piled high with chopitos, (mini squid) which is absolutely scrumptious, whilst I push the boat out and take the parriada de pescado which is a large platter of mixed fish consisting of succulent pieces of bream, sole and bass, accompanied by large prawns, mussels, a small squid and some calamares lightly griddled. The chef here knows how to cook fish properly; to take it off the heat just before it is completely cooked, so that it remains tender and moist. Seasoning is just perfect. I take my hat off to him or her. Notwithstanding the heavy bias towards the pescatorial end of the market, one may also enjoy a smaller number of meat based dishes, if so minded. For such a nice place, with no airs and pretensions other than smartly dressed staff who go about the job with obvious pleasure and skill, prices are very reasonable. The salad, quite enough for two persons, was €5.50. The chopitos were €8.50 and my large dish of fish was €16.50. Frankly, there was enough on my plate for two as well. I have paid more for less, and less well cooked, so we begrudged them not a tittle. And as for the table, yes, it was a good choice. Had we been seated at a table for two, there would have been a dearth of space for our plates, the bread, the wine, the water and last but not least the two dishes of mojo sauces, red and green. These in themselves were exceptional, not greasy as is often the case, fresh and seasoned. We then walked it off by taking a turn along the promenade, poking our noses into other eating places, delighted to see that the majority of them were doing very good business. It leaves us with a big problem, though. 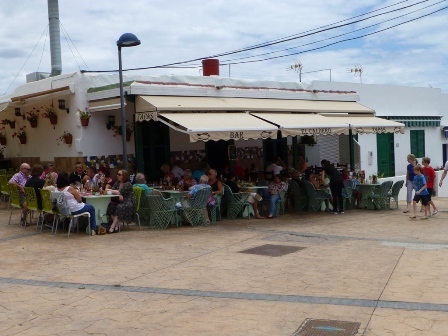 Next time we visit La Caleta, do we try somewhere different, or go back to the place that looked after us so well and where we had such a lovely meal? El Caldero Calle El Cabezo 8, Paseo Maritimo, La Caleta, Adeje. Tenerife. Tel: 922 16 80 99. Open: Daily, from 10 am to 11 pm. Loo Score: 7/10. Produced with news.CMS in 0,7786 seconds.